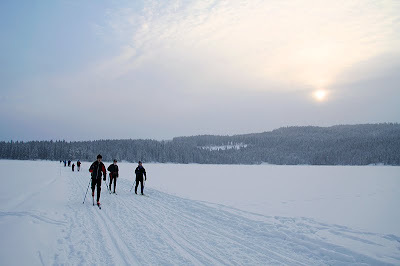 Skiers crossing a lake in Nordmarka. 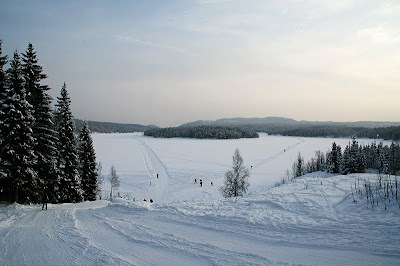 Nordmarka is the mostly forested region which makes up the northern part of Oslo. The forests are popular sites for hiking and skiing. Most of the forests are protected, and it is not possible to obtain building permits for cottages in the area. There are several lakes in Nordmarka. Todays picture, taken a couple of weeks ago, gives you a view of one of them. This lake is called Bjørnsjøen. Translated the name means Bear Lake.